Google Forms is absolutely one of the best free web tools to use for creating a wide variety of educational forms, surveys, and polls to use in your instruction. Over the last few months, Forms has witnessed the addition of a number of key features such as voice typing and new Forms templates which we have all reviewed in separate posts in the past. We have also featured a handy visual guide to help teachers learn how to create forms using the New Google Form. In today’s post, we are sharing you this excellent resource Forms Help Page introducing you to some practical keyboard shortcuts to help you get around Google Forms more quickly. These shortcuts work on the new Google Forms. 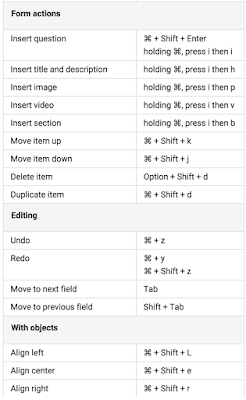 To see all the keyboard shortcuts in Google Forms, press Ctrl+/ (Windows and Chrome OS) or ⌘ + / (Mac). 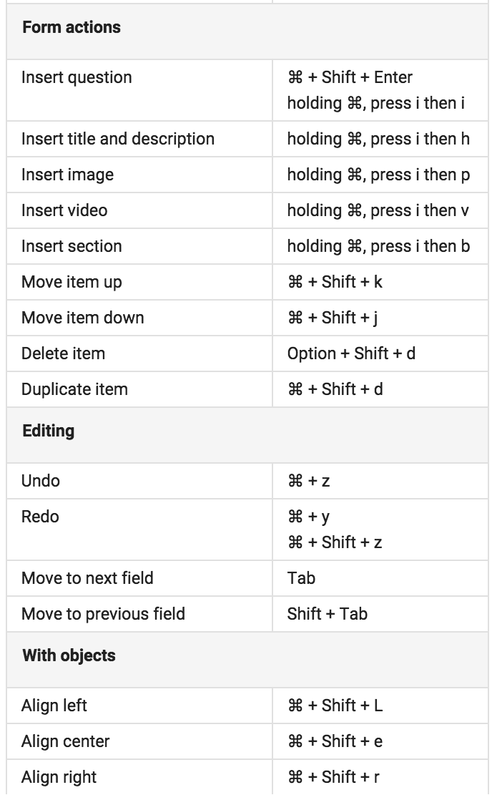 Here is a sample of Google Forms' shortcuts for Mac users.